> Senn Delaney > The Team At The Top - Is it Really The Team? CEOs and their senior leadership of most major corporations are usually highly proficient individuals who run their business units or functions efficiently but they may not work as well together to guide the overall firm. 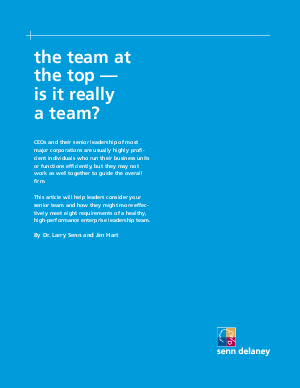 This whitepaper by Senn Delaney Founder Dr. Larry Senn and CEO and President Jim Hart will help leaders consider your senior team and how members might more effectively meet eight requirements of a healthy, high-performance enterprise leadership team.